You will learn how to create a fabric top from your choice of fabrics to match your decor - you will have one week to finish that step and second class you will construct your Tuffet for a beautifully finished piece of furniture for your home. What a great gift idea, just in time for Christmas giving! 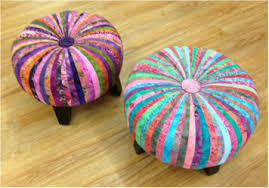 Requirements: Tuffet Kits will be in stock before the second class session. If you would like the instructions to build your own kit please stop by the store!